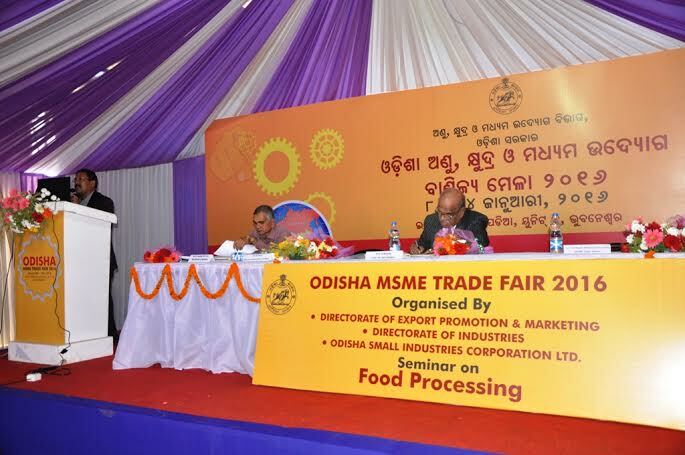 On the sixth day of MSME Trade Fair 2016, a seminar on ‘Promotion of Food Processing Industries’ was inaugurated by B. Bhuyan, Professor at Centre for Agri-Business. He stressed on the need to support and create awareness among entrepreneurs on the importance of food processing. Today’s generation is more dependent on ready to make, semi-processed or fully processed products and thus agriculture today has grown from supply of raw materials to complete packaged foods. He encouraged the entrepreneurs present to take up agriculture and increase food exports. Dr. P. K Bhanja from Directorate of Horticulture, Odisha, deliberated on the potential of food processing industries based on horticultural resources. He put emphasis on the growing demand of cashew-apple products; flower derived aromatic oil and fruit preservatives in the international market. Scientist and Head Agro Enterprise, Directorate of Agriculture & Food Production, Odisha provided insights on the agri business that might help the entrepreneurs start their own business based on geographic locations, availability of raw materials with low production cost. Joint Director of Fisheries Pratap Ranjan Rout gave a detailed presentation and statistical data on the potential of marine industries. He revealed that Odisha has the capacity to produce 4.50 lac metric tonne of fresh water fish. Currently 3.01 lac metric tonne is being cultivated and 90% of it is being exported. Apart from cultivation and farming, he also stressed on the need to have more industry standard cold storage units to enable maximum export of international market and boost economy. Subsidies up to `5 crore are being provided to each individual units of cold chain system, ice plants, pre-processing centres and other seafood processing plants. Deputy Director BK Parida of Directorate of AH&VS spoke on the potential of food processing industries based on animal resources. The growing urbanisation and increasing quality consciousness have created the market for processed milk, meat and egg products. Semi-processed and ready-to-eat products have flooded the retail markets. Up to `50-75 lakh subsidy is being provided for establishment of poultry layer and broiler farm under State Agriculture Policy. C Anandharamakrishnan, Principal scientist, CSIR_CFTRI, Mysore stressed on the need of modern technologies in food processing units. Food processing in the country is showing a healthy growth of 20 percent since last year, more than any IT industry. Subrat Panigrahi of IQEMS spoke at length about food safety and how street food vendors can be educated about food safety norms. “IQEMS has conducted three sessions till now in which more than 1000 street food vendors have been trained on food safety standards. Bidhan Das, Deputy Director, Indian Institute of Packaging spoke about food packaging technologies that can be used to increase the shelf-life of products. Among others, Nirupama Mishra of APICOL, Narayan Pani of NABARD, Deputy Director of National Horticulture Board, S.K Sarangi, Joint Director of Industries also spoke, N Pallai, Director of Industries and F.M Nayak, Additional Secretary MSME Department also spoke.